The Circle: A Guide for the Inner Explorer is a self-exploration set created by D.R. Taylor. The set includes 54 wedge shaped cards, a book, journal, velvet satchel and a thick, laminated spreadsheet. The premise of the system is to cast eight cards which, when arranged in a layout, fit together to create a circular mandala spread. Each position in the spread has a specific meaning, and also ties together with the position opposite it in the circle, which really adds an interesting layer of depth to the reading. "The circle is the super structure of the Universe. It is as common as a clock and as sacred as Stonehenge. From the microscopic electron spinning endlessly around the nucleus of an atom, to the mega spiral we know as the Milky Way, the circle is the powerful glue keeping the cosmos intact. Tap into your own inner space with this tool designed to help you recognize patterns in your life, access your inherent power and positively transform your life." The deck is less a divinatory system, and more a method designed for meditation, contemplation, inner reflection, guidance, exploration, ritual, celebration, insight, etc. The cards (dubbed "gems"), due to their odd shape, are not meant to be shuffled in the ordinary way. They come with a velvet bag where they can be housed. To cast cards for the reading, swirl them around in the bag with your hand and bring one out at a time. I was surprised to discover how insightful and valuable these pairings actually proved to be. They really helped give expansion and added dimension to the reading by connecting the dots, making more sense of the situation's elements as they are woven together. 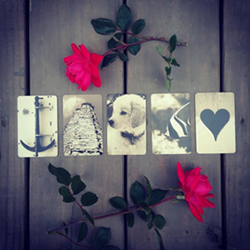 The cards are illustrated with attractive and simple symbolic designs. To give you an idea of size, the cards measure approximately 2" along the top arc, and 2 3/4" down the straight edge of the wedge. 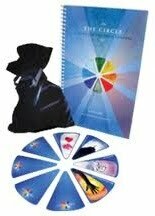 The set comes with a 64-page spiral bound book which lays flat for ease of use. There are a few pages introducing the deck and explaining how best to utilize the reading method. 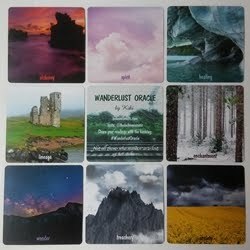 The bulk of the book is devoted to the card meanings, which are set up in a most helpful way. There is a full page devoted to each card in the deck, arranged alphabetically. 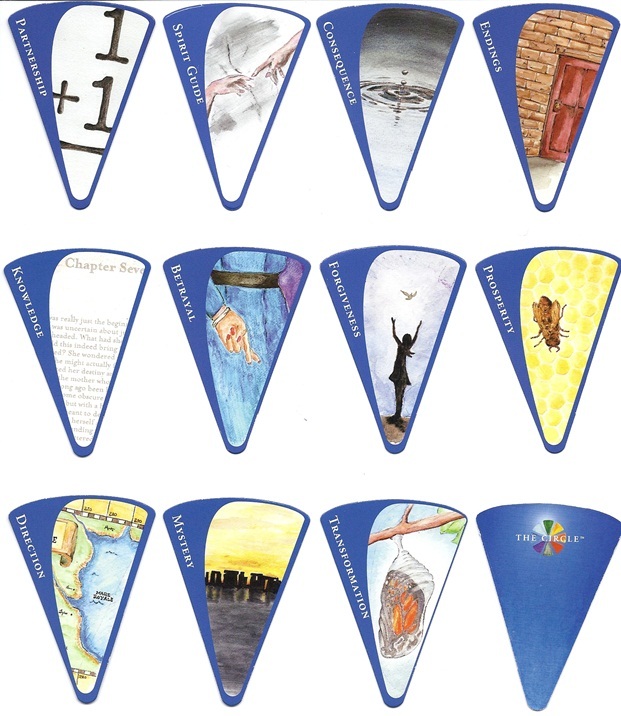 Each card page includes eight separate meanings, one for each position in the spread. 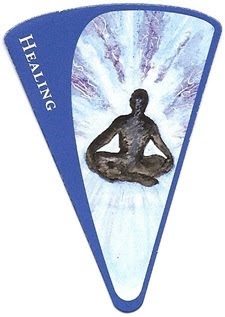 So, for example, if you get the Abundance card in your spread, and it falls in the "Challenges" position, you look up the page for Abundance and find the "Challenges" heading, where you will find the meaning as it falls in your spread. The 24-page journal provides space to document 11 readings. Each two-page section includes a line for the date and a few lines to write out the inquiry. Then there is a diagram of the mandala layout, with small spaces to write the cards pulled for each position. Beneath that are several lines for "Insight Summary". The second page for each entry is titled "Journal Page" and is a blank lined page available for notes. 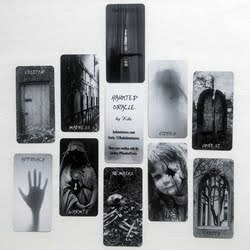 The first reading I did with this set was after my son had a falling out with some friends. The cards nailed the situation on the head, and sparked an emotional conversation between us which was very cathartic for him. 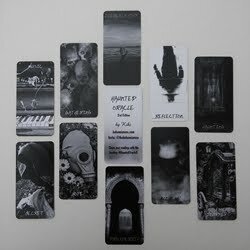 The reading was very helpful, and I was amazed at how the cards across from one another tied together so well. Another reading I did (see image above) had to do with transportation, and I received shockingly relevant cards such as "Journey", and a card featuring a stoplight on it, and another card whose meaning mentioned "enjoying the ride". I was fairly amazed. More recently I did a reading, inquiring about a relationship, and the cards spoke clearly and accurately about the situation and offered much food for thought. I find that The Circle is an amazing tool to help draw aspects of a situation to the surface, things that you hadn't thought of before, or a new perspective that you hadn't yet considered. The readings encourage you to face the truth of the situation from many different angles, and to find a way to work through it. Another great thing about this set is that no card reading experience is required. Anyone can use this deck for inner reflection, guidance, decision making and to better understand the different facets of a situation. It has a distinctly different flavor than tarot or oracle cards, and as such, I highly recommend it to anyone who would like a tool with which to explore life through a more therapeutic scope. 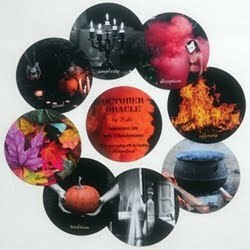 The Circle set can be purchased at TheCircleOnline.com, where you can also view a lovely video demonstration of the cards in action, by creator D.R. Taylor. 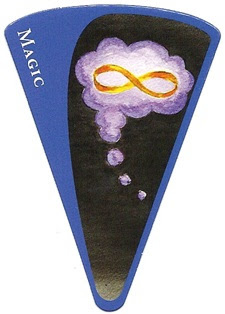 This deck review was originally published on my previous blog (Tarot Dame) on 11/14/10.